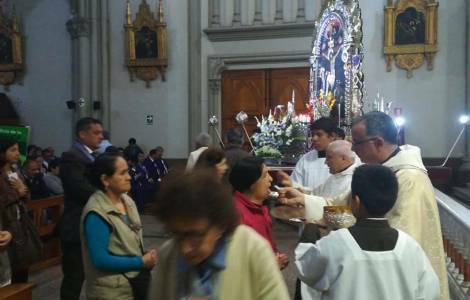 Lima (Agenzia Fides) - The Pontifical Mission Societies (PMS) of Peru, in response to Pope Francis’ appeal for the celebration of the extraordinary missionary Month in October 2019, have launched a year of preparation for this event. In the context of the novena to the Lord of Miracles (Señor de los Milagros), celebrated on October 28th, with great devotion among the Peruvian people, a large group of people gathered in San José parish to participate in the Eucharistic celebration that inaugurated the opening of this special moment of preparation. Posters in the parish presented the motto, the theme ("Baptized and sent: the Church of Christ on mission in the world") and the logo of the extraordinary missionary Month, as well as the service and mission of the Pontifical Mission Societies. The Eucharist was presided over by Fr. Leonardo Rodriguez, National Director of the PMS of Uruguay and continental coordinator of the PMS of America, and concelebrated by Fr. Victor Lívori, National Director of the PMS of Ecuador. During the homily the two priests invited the baptized to be a "miracle of God's love in our time".